Stock photo of an overview of Cypress Hills Interprovincial Park seen from the Reesor Lake viewpoint, Alberta, Canada. The beautiful scenery shows a view from a hillside overlooking Cypress Hills Interprovincial Park. 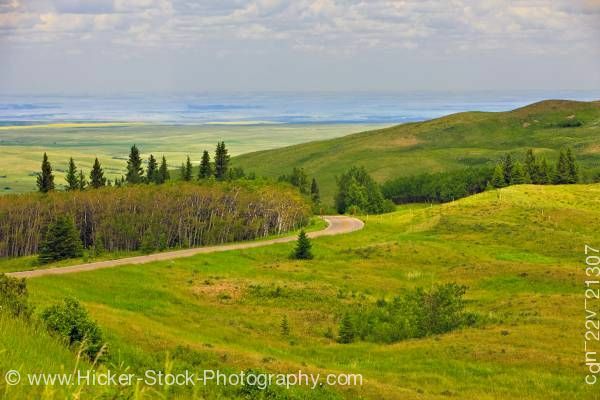 This stock photo shows a hillside overview of the serene Cypress Hills Interprovincial Park seen from the Reesor Lake viewpoint, Alberta, Canada. The beautiful scenery shows a view from a hillside overlooking rolling hills in colors of green, gold, brown, and yellow. A curving dirt road is seen disappearing off into the distance. A lone evergreen sits close to the road. To the left side of the road is a golden patch of trees with evergreen trees growing tall behind them. More trees are scattered in groups among the rolling hills. Beyond the rolling hills, sitting far in the distance is an open green valley which meet the blue lake and the sky at the horizon. Soft puffy clouds sit high the light blue sky. Overview of Cypress Hills Interprovincial Park seen from the Reesor Lake viewpoint, Alberta, Canada.